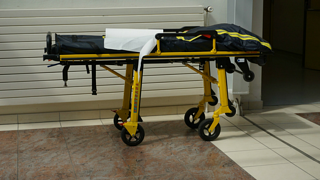 Any architect who has worked on a hospital or healthcare facility knows the importance of choosing the right flooring and flooring accessories. A porous flooring surface or mis-installed accessory can create a hotbed for bacteria, endangering patients and the doctors and nurses who take care of them. 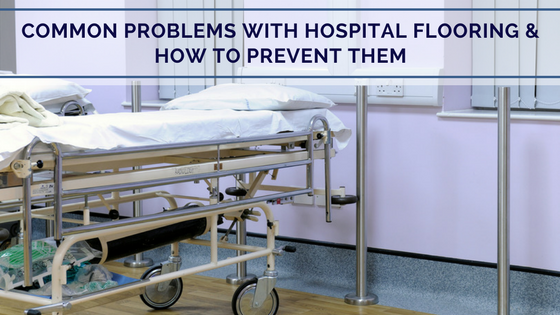 Here are the most common problems we’ve seen with flooring in healthcare facilities and tips for solving them. Hospitals are cleaned all the time, but that doesn’t mean that all bacteria can be stopped. Bacteria particularly thrives in places that are harder to reach, like seams and corners, or even under the flooring if there’s space between the visible flooring and the surface beneath it. Solve this problem by choosing heavy-duty, non-porous flooring. 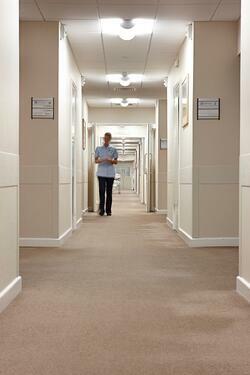 Our top two recommendations for hospital flooring are sheet vinyl and luxury vinyl tile (LVT). Both materials are stain resistant (important for potential spills of bodily fluids and the frequent chemical cleanings), able to withstand heavy traffic, and very durable. Proper installation is key to preventing fluids from seeping beneath the flooring, which can create a place for bacteria to thrive. Traditional wet glues can emit harmful VOCs which could exacerbate a patient's health problems, so instead we recommend using a low VOC adhesive for installation. Cove base presents a similar set of issues as the flooring itself - if installed improperly, fluids can seep behind it and bacteria can grow rampantly. Most hospitals’ cove base is glued to the floor, then heat welded at the seam on the bottom. While this gives a strong hold, there are better options. The first strategy is to install cove base with a dry adhesive like Opti-GripⓇ. Opti-GripⓇ is free of the toxic VOCs found in wet glue, making it a safer choice for patients. It also doesn’t require curing time, allowing for immediate foot traffic post-installation. It creates a strong bond, and fluids will not creep behind it. An alternative would be to go without cove base at all, instead curving the flooring up the wall using a cove former and capping seal. This option eliminates the seams at the floor that can be difficult to clean thoroughly and where bacteria can build up. Not only is this a sanitary option, but it is also often less expensive than installing cove base. Transition strips present a different set of problems as they can become a serious trip hazard. Transitions are required wherever one type of flooring transitions to another. Most of the time, this is no issue. In hospitals, however, you have to worry about rolling IV poles, wheelchairs, gurneys, and more that could get stuck on a thick transition, as well as patients of limited mobility who could trip over one. Instead, consider t-caps. Most of the flooring used in hospitals, particularly LVT and sheet vinyl, are of similar thicknesses, which makes t-caps the ideal choice. They are the lowest profile, making them safe for patients to easily step over and creating a smooth surface for wheelchairs, rolling carts, and more. They also are often less expensive than transition strips, and can even last longer than them depending on the profile you choose. Aluminum t-caps are often the best choice for healthcare facilities because they are sturdy and can hold up to heavy traffic. They’re also easy to install, simply tapping into the space between the two flooring surfaces, then self-adjusting to fill the space. 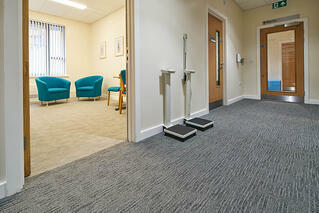 Patient safety is of utmost importance in hospitals, and flooring plays a major role in achieving this goal. By specifying the right flooring and accessories and ensuring they’re installed properly, you’re doing your part to help hospitals achieve this goal.